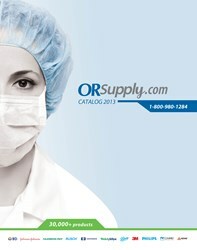 ORSupply.com’s new 2014 catalog features updated listings for surgical instruments and anesthesia and intubation supplies. ORSupply.com—an online division of DRE, Inc.—is pleased to announce the release of its 2014 medical supplies catalog. OrSupply.com has expanded its online catalog to include more than 30,000 products. Along with the print version, a PDF of the catalog can be viewed or downloaded online. The catalog is a showcase for ORSupply.com’s most popular lines of medical and surgical supplies, including: anesthesia supplies, intubation supplies and surgical instruments. "The new ORSupply.com catalog is an extension of our website and acts as an excellent hands-on resource for those in charge of purchasing for their facility,” Brent Kramer, ORSupply.com division manager, said. “We encompass an extensive array of products for all medical professionals." ORSupply.com is one of the largest online marketplaces offering supplies to hospitals, surgery centers, clinics, research labs and medical facilities around the world. U.S.-based customers can buy surgical supplies from ORSupply.com’s secure online checkout, while international customers can call to speak directly to a consultant. The company also offers an automatic re-order system to assist facilities so their stock is never depleted. ORSupply.com is a division of DRE, Inc. that specializes in selling and distributing medical accessories and supplies to hospitals, surgery centers, clinics, research labs and medical facilities across the United States. ORSupply.com’s goal is to provide medical professionals with a one-stop destination for researching and purchasing medical accessories and supplies. Founded in 1984, DRE is a premier medical and surgical equipment supplier that provides a combination of new and professionally refurbished or used medical equipment to industry professionals around the globe. DRE offers value to doctors by providing the features and reliability they need while still fitting within their budget. DRE is located in Louisville, Ky.